President Robert Mugabe's Zanu-PF party has won two-thirds of the vote in Zimbabwe's parliamentary elections. The result enables the president to change the constitution to install a successor without immediately calling elections as presently required. So far the party has taken 71 of 120 contested seats, and Mr Mugabe can appoint another 30 deputies to the 150-seat parliament. The opposition, which has 39 seats, has spoken of "massive fraud" in the poll. 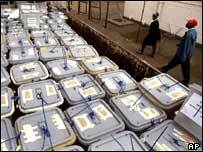 In the last parliamentary election in 2000, the opposition Movement for Democratic Change (MDC) won 58 seats. Mr Mugabe's Zanu-PF won 61 of the eligible seats but its parliamentary strength was boosted with the extra 30 presidential appointments, but this was short of a two-thirds majority. In these latest polls, the recently sacked information minister Jonathan Moyo won a surprise seat as an independent. Mr Moyo, the architect of Zimbabwe's tough media laws who fell out with the president over the appointment of the country's first woman vice-president, took the Tsholotsho constituency from the opposition MDC. The BBC's Themba Nkosi says Zanu-PF supporters have taken to the streets in celebration in northern parts of the country, but the atmosphere is more muted in the second city of Bulawayo where the MDC draws its support. Security is tight, with police patrolling the streets warning the winners not to provoke those who lost, he says. Justice Minister Patrick Chinamasa told the BBC's Focus on Africa programme that he was "over the moon" about his party's victory. 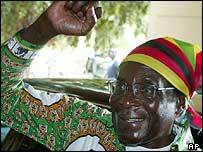 All Zanu-PF's hard work had paid off and the result was a vindication of the party's good policies, he said. He rejected claims by the UK, the US and Germany that Thursday's election was "flawed". "These were the most free and fair elections in the world," he said. Mr Tsvangirai accused the ruling party of stealing the election. "We are deeply disturbed by the fraudulent activities we have unearthed," he said. "We believe the people of Zimbabwe must defend their votes, their right to a free and a fair election - this is what has been denied," he said. President Mugabe, who has been in power for 25 years, dismissed opposition complaints as nonsense. Average turnout was below 50%, chief elections officer Lovemore Sekeramai said while local election observers describing the process as smooth. The Zimbabwe Election Support Network, which had some 6,000 observers in the 8,000 polling stations, says that some 10% of would-be voters were turned away, either because their names were not on the electoral roll, they did not have the right identity papers, or they were in the wrong constituency. One man told the BBC News website that his name had been taken off the register since the last election and yet the name of his aunt was still there, although she had died six years ago. Human rights groups say that hundreds of thousands of "ghost voters" appear on the electoral roll of 5.8 million people. They fear these entries could be used to record fraudulent votes. Our correspondent says MDC officials were visibly shocked when the Harare South seat went to Zanu-PF, leaving them to question the voters' register and the re-drawing of constituency boundaries. Parliament speaker Emmerson Mnangagwa, once tipped to succeed Mr Mugabe, lost in the central Kwekwe constituency. MDC candidate Heather Bennett, wife of jailed MP Roy Bennett, lost his Chimanimani seat.